What do Oprah and Samson Have in Common? In the last couple of weeks, I’m hearing from so many women who are anxious and reluctant about participating in the upcoming 21-Day Challenge. Their fears stem from their past experiences with other weight loss programs. They start strong, they begin to see results and then for one reason or another they sabotage themselves. As I read the similarities in these womens’ stories, it reminded me of a post I wrote a couple of years back. I think its worth reposting as many of you prepare for the upcoming challenge next week. at being strong in one area of your life does not necessarily have a cross-over effect? You can be totally competent in one area of your life and be the complete opposite in another. This point became even more apparent to me as I was reading about the story of Samson in Judges 13-16. Many of us can identify with Oprah. You’re on a roll; you’re doing so well-it seems like you’ve finally kicked this weigh thing (or other issue) and then BAM-you start again on that all too familiar slippery slope and the next thing you know it you’ve sabotaged yourself again. You feel like victory will never be yours. Like Samson in the bible, you would think that Oprah would be the least likely person to fail. Samson seemed to have everything going for him. He was dedicated to God from birth, he possessed incredible strength and had amazing parents. Oprah has personal chefs; personal assistants and personal trainers at her disposal 24 hours a day. 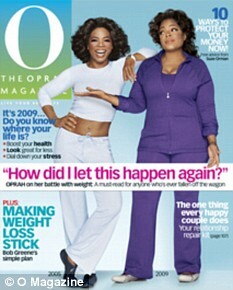 If anyone should be able keep weight off it should be Oprah, right? Yet both of these ‘giants’ were (are) not able to move past their appetites. So the question becomes, “what are us mere mortals to do?” If these powerhouses could not control their flesh, then what chance do we have? And that right there is the point; WE DON’T STAND A CHANCE against our appetites and sensual desires. We really are powerless to change ourselves. God wants us to draw our strength from Him and not in just one or two areas of our life but in every single area– Especially the areas that seem impossible— like your weight. We often deceive ourselves by believing that if only you could afford a personal trainer, if only you had the time to make the right foods then you would lose weight, if only we had more time in our schedule or if only we had more motivation. It’s not about trying harder or doing more; it’s about giving God full reign of our lives. With His guidance, an organized plan and some accountability you can have success finally and forever! Despite his strengths highlighted in the bible, Samson played by his own rules. He violated many of God’s laws, he was controlled by his flesh and he confided in the wrong people. Can you see how you also may not be totally submitted to God? It’s never too late to start over. Learn from Samson (and Oprah) and submit your weight release to God. He is more than able to handle it. This principle of submitting to God is exactly what the 21-Day Challenge is all about. If you’re really ready to make this change, but need some help, consider working with our mentors and myself in the 21-Day Challenge VIP program. We can help you make those shifts in your life and understand what’s been holding you back. Spots are very limited so don’t delay. If you’re tired of starting over and want to understand how to stop this frustrating cycle then register right away. I submit my weight loss and health to God!